Thanks to David Partridge and Tony Cook, we have been able to complete the first step of the DSS reboot: a 64 bit version including the last dcraw. The 32 bit version is also updated and includes the same dcraw. Of course, it's still a beta so we need you to point out the problems. Edited by Tonk, 02 April 2018 - 04:31 PM. Edited by atacamastar, 02 April 2018 - 02:29 PM. Quick and dirty first run of the 64 bit version -- FAST --- and waaaayyy better color rendition of OSC images -- BRAVO!!!!! Edited by atacamastar, 02 April 2018 - 03:13 PM. I got all kinds of security warnings when I tried to open the install file (64 bit). Anyone else? No - I am using Win 7 Pro x64. Edited by Tonk, 02 April 2018 - 03:53 PM. I'm on Win 10, with AVG Antivirus running. I've seen the warning about unsigned software. This was different. 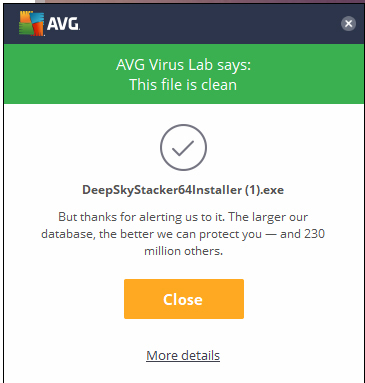 Both Windows defender and AVG warnings popped up, with the AVG warning that the software could be dangerous. The message from AVG said they were analyzing the program, and would get back to me. I'll give it some time. I may be too paranoid about this sort of thing, and apparently my computer is too! Edited by Steve OK, 03 April 2018 - 06:53 AM. One small bug I think. I had a tiff master flat created by the "old" DSS and tried to use it with the new beta, but it kept telling me the sizes do not match. So I went back and chose the original raws to rebuild the master flat and so far it's working. I'll try again with the resulting master flat tiff to see if it works. Maybe it's some sort of compatibility issue between the way masters tiffs were created in the old version vs new. 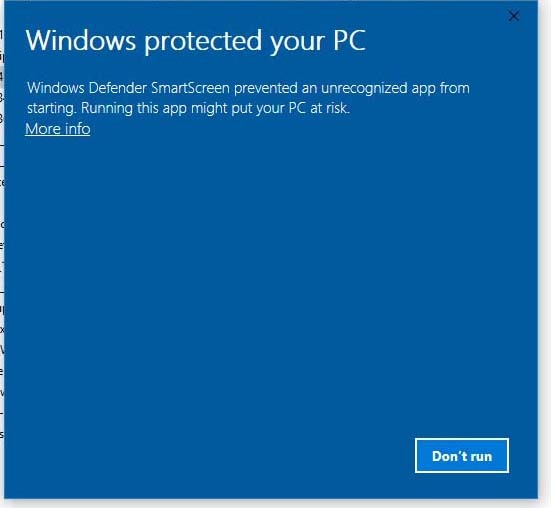 'm on Win 10, with AVG Antivirus running. I've seen the warning about unsigned software. This was different. 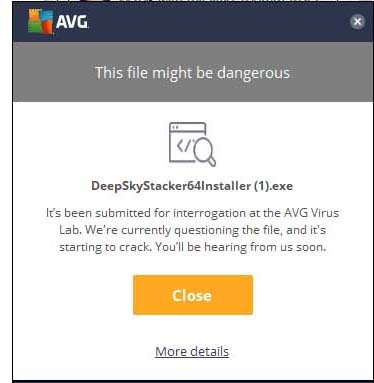 Both Windows defender and AVG warnings popped up, with the AVG warning that the software could be dangerous. The message from AVG said they were analyzing the program, and would get back to me. I'll give it some time. I may be too paranoid about this sort of thing, and apparently my computer is too! If you are able to you can down load the source package from GitHub ( https://github.com/LucCoiffier/DSS ) look on right hand side of the page from the green button ("Clone or Download") - click it and pick "Download ZIP". Once you unpack the ZIP you can either build the programs yourself from the sources (if you have Visual Studio 2017 community edition - free) - or you can extract the pre-built installers from the directory "Installer\InstallerPrograms" from the ZIP package. Edited by Tonk, 02 April 2018 - 04:06 PM. Btw, I got the same warning as Steve. Just click on "More Info" and click on run anyway and it's fine. Was the build Digitally Signed? Thanks, Tonk. I do trust you, by the way. Like I said, just paranoid! I did the same, and that is when the AVG warning popped up. Not yet - trying to find a way that doesnt cost $250 when we are only at pre-beta "try it and see" stage. Edited by Tonk, 02 April 2018 - 04:45 PM. I am delighted to hear that DSS has been upgraded. It is great software and easy to use, and you don't need to join a "cult". Isn't DcRaw being replace by LibRaw? Yes - thats our next move. But first we wanted a 64 bit port completed and to find out how well it works. I will put it through its paces tomorrow stacking 36mp full frame and 50mp medium format images. For now, bed. Edited by Tonk, 03 April 2018 - 07:07 AM. Thanks all - excited to try the 64bit version! Huge fan of DSS.